So, is the ozone hole fixed? Bishop Hill reports that the ozone hole is back. This seems to be the story. A guy with a blog read an abc news report from September 2001 (I’m not sure what year) and some people seem to be surprised that the ozone hole didn’t instantly fix itself with the introduction of the Montreal Protocol. I can’t help thinking that this interpretation shows a worrying lack of understanding of a big atmospheric issue. The hole only appears in the Southern Hemisphere spring when the sunlight returns and releases chlorine (sourced from CFCs) from polar stratospheric clouds, which store it over winter. The “hole” occurs because this sudden influx of chlorine decimates the ozone, which then recovers each year. 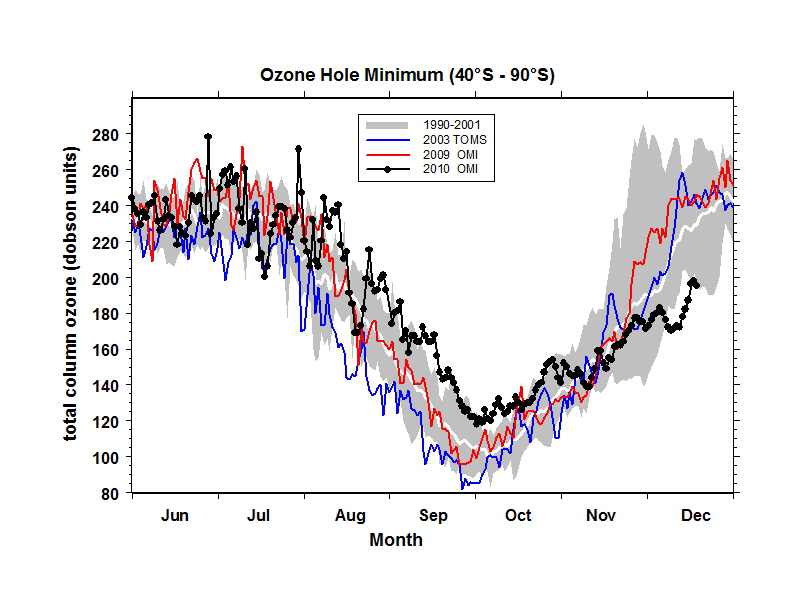 Minimum ozone levels in the "hole" region. However, there’s also a more general decline in ozone globally. The big problem is that the chlorine atom isn’t removed in the reaction that removes the ozone so each one does a lot of damage. There’s more background on wikipedia and some nice plots, including the one above, on the NASA website. Oddly enough, Science very recently (April 8th) published a news story about a GRL paper (which is still in press) reporting the first signs of recovery of the ozone hole, which weren’t previously expected until the 2020s. So you’d expect this information to be know by people interested in climate science and legislation.